While the exact plot of the film isn't clear, the sneak peek suggests there's trouble in the kingdom. Elsa and Anna are back. 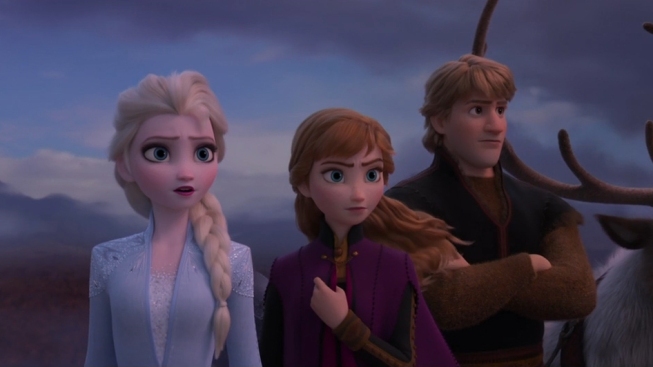 Disney released its new trailer for "Frozen 2." While the exact plot of the film isn't clear, the sneak peek suggests there's trouble in the kingdom. The teaser starts off with Elsa watching the rise and fall of the waves as a storm brews overhead. She then musters her courage and manages to run across the water by making a path of snowflakes and ice. However, she quickly falls into the surf. The two-minute clip also shows Anna leaping from a clip and her main man Kristoff riding fiercely on his trusty reindeer Sven. Of course, their loyal snowman Olaf is there, too. At the end of the clip, Anna grabs Kristoff's sword and seems to fight off someone—or something. The film stars Kristen Bell, Idina Menzel, Jonathan Groff, Josh Gad and more. It hits theaters November 22.